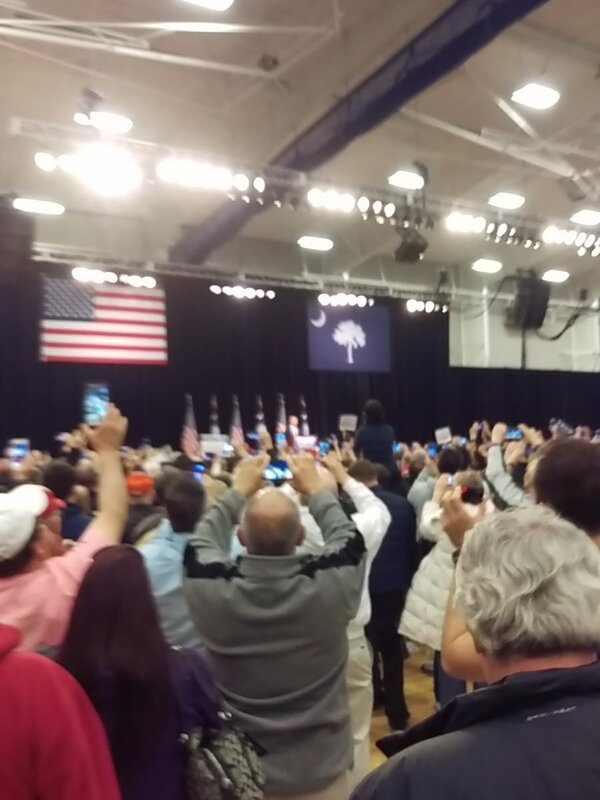 If you want to know why Donald Trump won in South Carolina tonight, you need only have attended his rally yesterday at the Myrtle Beach Civic Center. Here’s part two describing my four-day visit to South Carolina, focusing on the Trump rally. 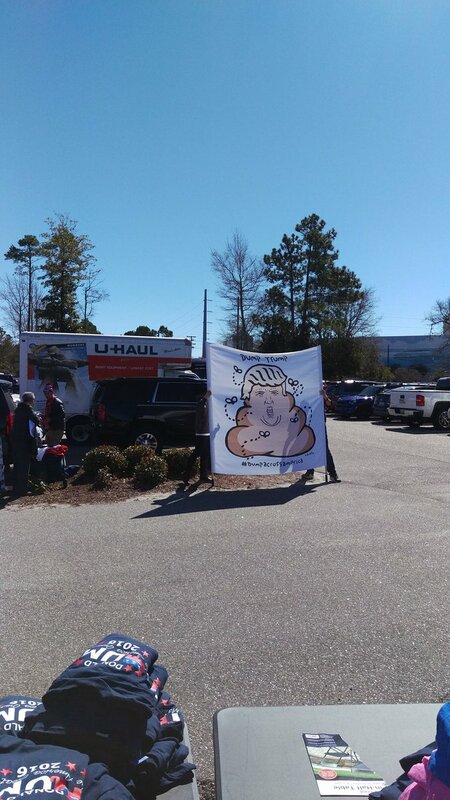 After deciding not to wait for The Donald to vacate my hotel, we headed to his nearby rally. When we arrived, the line snaked outside the Civic Center for about ¼ mile. We took our place at the end and waited. 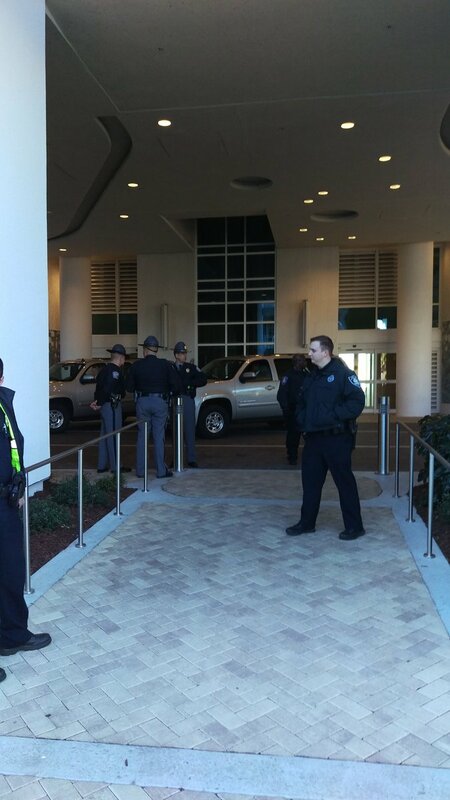 Fortunately, in contrast to his New Hampshire rally, this time they had multiple security screening entrances so the line moved quickly. 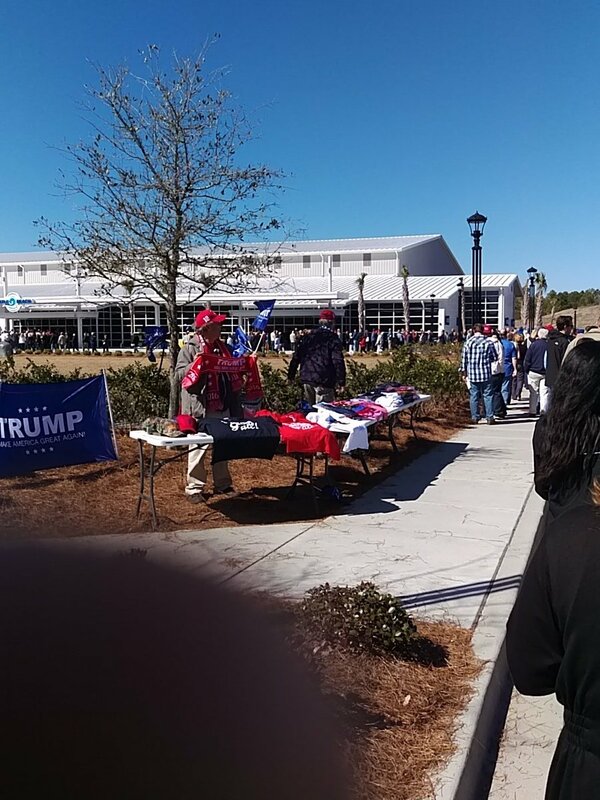 As we moved forward, there were the usual vendors at a Trump rally hawking pins, buttons, shirt, caps – anything with the Trump name and face on it. Inside, Elton John’s Rocket Man blared so loud the floor shook. 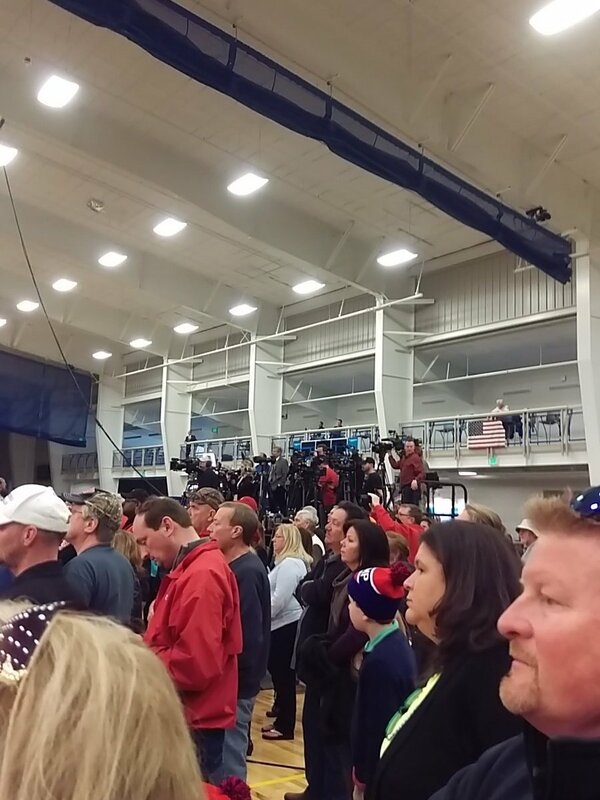 There was an air of expectation as the large crowd waited for The Donald to arrive. The floor of the Civic Center was packed – I estimated maybe 5,000 people pressing forward to the stage, trying to get a closer glimpse of the candidate. As always, the media was fenced off in the back – I recognized CNN’s Dana Bash and NBC’s Katy Tur, among other talking heads that were in the media pen. As is typical for a Trump crowd, there was a healthy cross-section of demographic groups, but there was a definite segment of what appeared to be the working class voter. For example, a group of bikers gathered next to me, with one of them wearing a leather jacket and clutching a Trump poster. Finally, to a roar from the crowd, The Donald appeared on stage and immediately launched into his speech. It touched on the familiar themes, and was delivered in the same stream-of-consciousness, lack-of-detail level of specificity that characterized his previous speeches I’ve seen. But he sprinkled in references to recent events, such as his recent dustup with the Pope that showed he was paying attention to the campaign narrative and was trying to influence it. He also played to his specific audience, in this case mentioning a video of workers for the Carrier Corporation, which has corporate headquarters in South Carolina, who found out their manufacturing plant was moving to Mexico. “I believe in free trade, but it has to be smart trade,” Trump thundered. He would return to this theme again and again throughout his speech by critiquing the politicians and “political hacks” that currently run American’s trade policy, but also laying out his strategy for preventing this from happening in the future. Trump briefly shrugged off the recent dustup about whether he had first supported the Iraq War “It was very early in the war – I might have said something” and also briefly noted that the Pope had apparently been misinformed about what Trump had said about immigration – and then he moved on. No one in the audience appeared nearly as concerned about these issues as the media seemed to suggest they might be. As always, Trump riffed on every possible topic, often veering from one topic to the next with no apparent logic but without missing a beat. He promised to rescind Obamacare “which has destroyed many businesses” and then moved on to attack Ted Cruz as a liar – “he doctored a photo of Marco Rubio!” as well as playing dirty campaign tricks in Iowa against Ben Carson. He noted that his Republican rivals are all beholden to special interests “Cruz is controlled by the oil lobby…he’s Robin Hood” – while he, Trump, is self-funding his campaign (“I don’t believe I get enough credit for that.”). He repeated, to great applause, that every time Mexican officials say they won’t pay for a “great wall” on the southern border, it is only going to get 10 feet higher. “China built a Great Wall – and they didn’t have Caterpillars made in America”. Trump ended by asking the people to come out and vote for him. “We are going to start winning, winning, winning” he intoned, to rising applause. As we left the arena, people seemed in a festive mood, as if they had attended a great rock concert or sporting event. “You’ll remember this great meeting” Trump told them near the end of the speech. I’ll have a third post up describing the rest of my South Carolina trip soon.